Welcome to Ben Crenshaw Studios. This site is devoted to original knotwork created by the artist, and information about his ongoing projects. More than an outlet for one man�s personal creativity, Ben Crenshaw Studios is dedicated to expanding the audience of this richly vibrant art form. Currently Ben is working on two of his largest most ambitious projects to date, an instructional knotwork book, and an eleven by eleven foot monster that will probably take over a year to complete. Visit the Projects page to learn more about both the book and the Megabird. There are book page previews posted and Ben will be posting sneak-peeks of the Megabird work in progress so knotwork fans can follow the development of this extraordinary creation. To �meet the artist� visit the About page for more information about Ben Crenshaw, his freelance graphics business BC Designs, and the Enchanted Glyph creators of fine historical and mythological jewelry. Ben has also made available some of his original designs for use on home computers and the web. 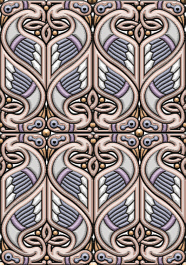 Visit the Web Art page to see the latest graphics Ben is sharing with the community of knotwork fans. On our Sponsor page we gratefully acknowledge the businesses and individuals who have provided financial and creative support for Ben Crenshaw Studios and in particular the Megabird project. We hope you enjoy your visit here at Ben Crenshaw Studios. Stop in again to see how the Megabird is coming along. Be sure to look for new downloads on the Web Art page. We�d love to hear from you. Your questions and comments are a vital part of the artistic process so please feel free to drop us a line.